Thank you to Cllr Park-Weir and our contractor Timberwise Fencing. Also, many thanks for the grant from ‘one of our local commercial businesses’ which helped pay for this anticipated, replacement noticeboard. 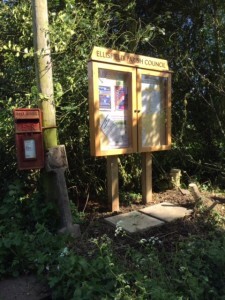 Importantly, all can step up to the post-box, and onto the slabs in all weathers, to read or post notices. Historic hydrant now moved to a hiding place! Delays are much regretted, but EPC got there eventually. Hope it works better for all now. This entry was posted in News on 22nd May 2015 by Clerk. Delicious refreshments served after the meeting. All Ellisfield residents are welcome – its all free! This entry was posted in News and tagged Annual Parish Meeting on 19th May 2015 by Clerk. 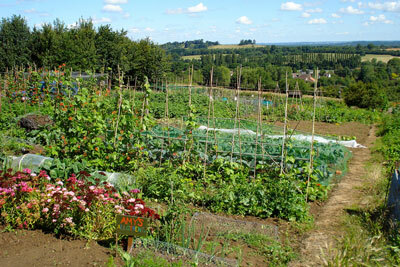 Ellisfield Upper Allotments, for a small annual rent? This entry was posted in Adverts, News and tagged allotments on 14th May 2015 by charlie.